Everything you think you know about Net Neutrality is WRONG. 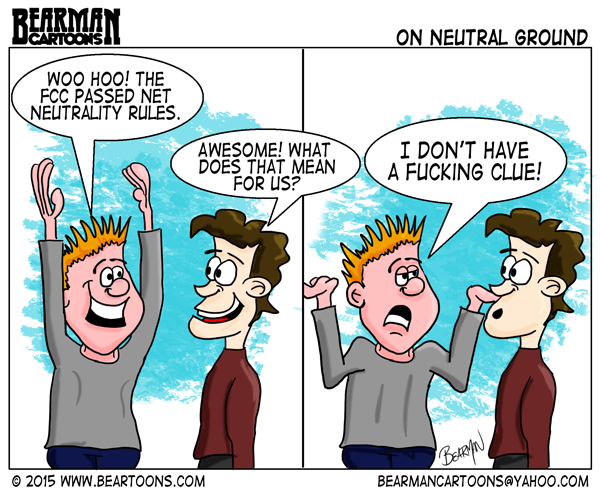 I am sure there are smarter people out there than me who may clarify some things that I don’t know but it seems for the most part the general public is misinformed about what Net Neutrality is and what the FCC is or isn’t doing about it. Pretty basic. In other words, it means that when I have a broadband relationship with an Internet Service Provider (ISP) AKA cable/phone company, I expect that I can access what I want and they won’t discriminate on the speed of my internet traffic from any website. So my Netflix, in theory, should be just as speedy as content the I get from the ISP’s own owned websites. Last week the FCC reclassified wired and wireless Broadband under Title II of the Communications Act, essentially making it a Public Utility with more regulations on ISPs and how they do business. Net Neutrality proponents and the Obama administration cheered while Republicans and ISPs thought the measure went too far. As someone who is a proponent of Net Neutrality in principle, I am left scratching my head as to how this move by the FCC really has done anything to protect the consumer. MYTH: The FCC’s actions have removed paid prioritization and high speed lanes that would benefit one website over another. FACT: There are still high speed lanes on the internet and will be with this order. First some background. When my mother was young and her family drove from Cleveland to Cincinnati, there were no highways. Trips took longer and there were more frequent stops along the way. After the highways were put in the drive time decreases dramatically as did the number of necessary stops. The same is true on the internet. When the internet was first starting out the ISPs built the local roads and if I was sending an email from Cincinnati to Los Angeles, it would hop from server to server. Then companies called Content Delivery Networks (CDN’s) came in and starting building the internet highways allowing data to flow quicker and without jumps. Unlike the government, who built and maintained highways, these infrastructures were created by private businesses. They would pass data off between themselves and to ISPs in a more efficient manner. For the most part they enter into Peering Relationships which says assuming we are both sending and receiving the same amount of data we won’t charge each other. But if one of us starts sending more data thanwe have agreed to, there is usually a fee involved. Enter Netflix. If Netflix had to rely on the old local roads to deliver their streaming content, there would be missing data packets and as some of us have experienced dithering or skipping while we watch a movie. By entering into a relationship with a CDN who has servers all across the nation, they can duplicate their content into those servers. So if someone in Cincinnati orders a movie, they are streaming from a local server as would someone in Los Angeles stream the same movie from a duplicate copy of it on a local server. Netflix has to pay these companies in order to have their content on their servers. This costs a lot of money, so in order to reduce the costs, Netflix started approaching the cable companies asking them to put their content on the ISPs servers. Some agreed under a Peering Relationship but given the amount of internet traffic created by Netflix, some expected to be paid. Netflix created a lot of noise last year about this issue with Comcast. Netflix thought they would save money by skipping the CDNs and then cried “Net Neutrality” when the ISP’s expected to enter into a similar relationship. Under Title II, the FCC said they would keep an eye on the peering relationship and even the paid ones but aren’t cutting them out. Should the FCC start saying that a relationship between a edge provider like Netflix and an ISP like Comcast cannot have money exchange hands, Comcast would probably say, go back to dealing with CDNs and we won’t have to worry about not getting paid. Either way Netflix will continue to pay to make sure their streaming service is fast and doesn’t break up. So if I started Bearman Video Streaming Service and didn’t have the money that Netflix does to use the “highways”, my streaming service will be slower and probably choppy. So in essence, high speed lanes are still in effect. MYTH: The FCC’s actions will mean more competition and I will pay less for my broadband. FACT: Could happen but probably won’t. Let’s imagine that the FCC comes down hard on ISPs and disallows any paid peering relationships. Without the money coming in from one end of the stream, ISP’s are going to look to make that up on the other end, meaning higher prices for you and I. Now part of Title II does give the FCC to control pricing but for now they say they aren’t going to enforce that part of the order. Additionally, cable companies were protected to some degree from paying the high utility pole fees that phone and electric companies do in order to encourage expanding their networks to as many customers as possible. However, under Title II, that could change. Higher fees for them, mean higher prices for us. Finally, the most impactful reason that the FCC’s actions won’t improve competition and benefit the consumer is because they are choosing not to require what is known as “last mile unbundling” Requiring last mile unbundling would mean that ISPs would have to lease their lines at a wholesale rate to other customers. Imagine the amount of competition and driving down of pricing that would involve. In the cell phone world, I could potentially have T-mobile pricing plans (which are great) on a Verizon Network. Net Neutrality in principle is a great thing, however I am not convinced that the action from the FCC has done anything to actually be pro-consumer. Technical stuff. I’m with the guy who say’s I haven’t a clue. I love your cartoon work! Thanks Deb. There is probably tons I still don’t know. Most things that are done are not pro-consumer. They are pro the 1% unfortunately. Thanks for the in-depth post on the subject. I fear that often sums up my political knowledge. Your toon sums up quite a large group of people, I’m sure! What I hate is when the electric company has a bunch of storm damage they get to go to the government and ask them to raise our rates to pay for it. If I have storm damage, I have to pay for it myself. 1. Those Big evil companies already signed up for waivers so they won’t be effected by this. 2. more government regulations means small ISPs are going to have a hard time keeping prices down. 3. Charter and ATT already raising prices due to the tax increase this regulation has caused. 4. Since it’s now a “utility”, the government now has power to block and redirect internet traffic as it sees fit. This also includes blocking access to webites that are considered “national security risks” such as Wikileaks. So congrats everyone that supported this, you got played hard. this bill was a scam from the getgo and will have little effect on the big telcom companies. Question on 3. Was it new taxes or expectation of higher pole fees? I think many people got caught up in the idea of it without learning enough about the implications. Interesting read Bearman, more research is definitely need. Thank you for posting this among all the confusion. The bottom line is that it’s usually going to end up being about the bottom line.